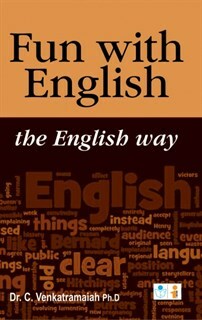 This book - FUN WITH ENLISH - contains three chapters. jokes mostly based on the finer points of the language. some of which are humorous). which enrich the language, known to be dynamic. students, while enriching their .English skills at the same time. I am a student and found english difficult. But this book changed my attitude towards the language. Now I like english subject very much. I liked this book very much. I am not good in english but learnt few easy techniques to speak with the help of this book. Thanks to the author. the book is easy to learn. But I want more information. I want to learn tougher english grammar. So the author should add more pages. English is easy and difficult at the same time. I gifted this book to my cousins which they liked very much and learnt the language quickly.